PZL SAÚDE, FIRST AND ONLY OSMOMETER MANUFACTURER IN BRAZIL. The Osmometer PZL1000 v1.1 is a precision electronic device, which determinates the osmolality of a sample by measuring its freezing point. It sets the concentration of chemical, pharmaceutical solutions, food, blood, urine and others. Automatic operation: the operator only doses the sample, the analysis is done automatically by the PZL1000 v1.1, including the calculation of the added water percentage. It reduces the risk of "human error" and also allows the operator to do other activities while the analysis is done. Automated calibration: the calibration is done by the Osmometer PZL1000 v1.1 software, the operator only needs to do analysis with the calibration solutions indicated. 2 Calibration ranges: from 0mOsm until 2000mOsm and from 2000mOsm until 4000mOsm, ensuring greater analysis accuracy. 4 analysis on the display: display showing the latest 4 analysis, showing the time, osmolality and freezing temperature of each sample. Analysis memorization: internal memory, automatically recording the last 2500 analysis (even if the power is off). Flexible system: User can configurate it to analyse by the "plateau" (precise) or "time" (faster) system. Tropicalized cooling system: it operates normally at room temperatures from 0°C until 42°C, without the need for any forced air conditioning or cooling system equipment. Precision (repeatability): ± 2mOsm / kg water (range I) and ± 4mOsm / kg water (range II). Room temperature for operation: 0 ° C to + 42 ° C.
Osmometer size: 330 x 370 x 370 mm. Weight: 40 kg (approx. ), with its carrying case. The Osmometer PZL1000 v2.0 is a precision electronic device, which determinates the osmolality of a sample by measuring its freezing point. Thermal Printer Interface: allows to simultaneously connect the Printer Matrix and Thermal. 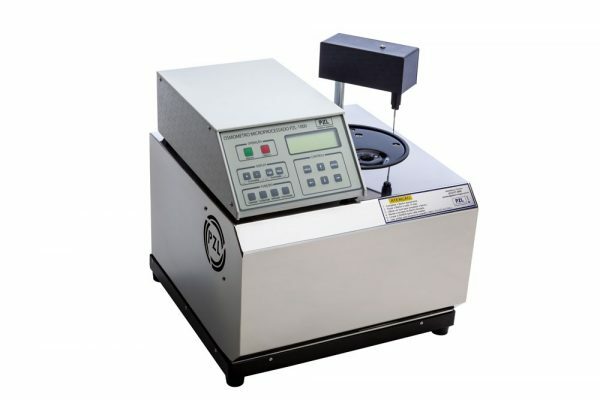 The Osmometer PZL1000 v2.0 Security is a precision electronic device, which determinates the osmolality of a sample by measuring its freezing point. Print calibration values: ability to print the data also obtained in the calibration of the equipment. Access by using password: restrict access to configuration routines PZL1000 v2.0 Security by using a password.